I'd been looking forward to last week's Angel Intuition class for days, weeks even. It was Uriel's turn to lead the class. He's the Archangel of Fire, prophecy, mysteries, magic and many other things. He also helps us discover our soul purpose and our spiritual identity. It's a big thing to look forward to! Rather than jump into the opening meditation, our teacher began by asking how we planned to use our skills. Did we want to become professional psychics? 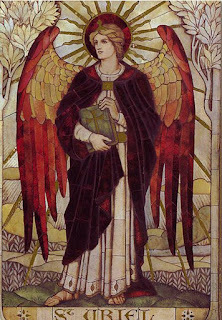 Would we be interested in giving healing messages from the angels? Angels are known and accepted all over the world. We read about them in the Bible, they're on hundreds of Hallmark cards, and with the likes of Doreen Virtue there are also dozens of books on angel channeling, angel healing and angelic influences. In the Bible angels can even come across scary, for example Archangel Michael casting Lucifer out of Heaven. But aside from that, most of the angelic references are warm and fuzzy descriptions of love, comfort, and reassurance. All of this is true, but in my experience angels are also strong, powerful and vibrant beings. They are result oriented, for example I wouldn't call on Archangel Michael unless I wanted him to do something tangible for me. It can be as simple as delaying a train so that I won't miss it. And when he doesn't delay the train, he delays the meeting that I couldn't be late for. True story! With this in mind you can imagine how invoking Archangels every week brings disruptive change to your life. I missed the first week with Michael, which was just as well because I’ve been calling on him for two years. Gabriel was direct with his “communication” messages and Raphael was brilliant from a healing and grounding point of view. This week was Uriel's turn, and he's known for helping us find our soul purpose. This is why the class started with a discussion on our vocational interests, rather than a healing meditation. So how does this fit into my life? Technically this is a psychic development class and though I do enjoy it, I'm not keen on pursuing it professionally. Maybe it’s because I stress out when I'm put on a spot, but more importantly, I have little patience for questions about the future, jobs or relationships [oops!]. Our soul knows the answer to these questions and if we made a consistent effort to connect with our Higher Self, we’d see things clearly. I’d rather point clients in this direction and give them one of Sonia Choquette’s books. If they’re already on this path, the occasional psychic reading will give confirmation for what they already know. The responsibility ultimately lies with the client, and having connection to HS will let them listen to advice without losing their personal power. I'm still forming this opinion, but it will shape my approach to psychic readings in the future. So what's left? I really enjoy healing, and there is more to this than energy work. A good-channeled message can be as therapeutic as anything else. The good news is we were given an opportunity to explore all of these topics in last week’s class! The teacher put us in pairs and told us to ask for a healing message. The classmate I was working with was getting over a bad flu. It was the first time she had been out in a week and the teacher suggested that I give her an energy healing if it felt appropriate. The first thing that popped into my mind was an article on the side effects of energy work, one of which is dehydration. Water is charged with energy and emotions, just think of the Suit of Cups in any tarot deck. It also enables the flow of energy through our body. If there is too much energy work going on we run the risk of becoming dehydrated. My classmate was getting the flu because she wasn't drinking enough water to bankroll her energy requirements. Drink more water - a simple yet effective healing message. After this quick reading I gave her a potent mini-healing, focusing on her immune system and on her grounding. As I mentioned earlier, I had been asking for clarity on my soul purpose and my career. By career I mean anything that takes up enough of my time and energy to become a full time job and part of my personal identity. The questions I've asked myself include: do I want to be a mom, a wife, a career woman, a healer, a psychic, an author, a friend, or even a free floater? My soul knows the answers, but insecurity and ego get in the way. Intuition tells me that I am not interested in climbing the corporate ladder for "height's sake." I'm still on the fence about marriage and family life. I absolutely love healing but I’m still a newbie so the role it will play in my life is unclear. And then we've already established the fact that I am not keen on exploring psychic readings for $$$. Despite my blog title I don't think of myself as psychic in the traditional sense. I like to think that I see and hear things when I am grounded and energetically open. The only difference is that I now try to make this part of my daily routine. Like I mentioned this was Uriel’s week and I was hoping for some answers. My classmate started by telling me that she'd seen a past life of mine. It was a very detailed vision and it took her a few minutes to collect her thoughts. She had seen me as an old woman drawing water from a stream in Mexico. My classmate – let’s call her Clarissa - had been to that spot in her travels and she identified it as sacred space. She went on to say that I had been a source of strength and wisdom for the community in that incarnation. I was some sort of priestess, and worked very closely with water. She saw me drawing a bucket from the stream, and sharing it with the community as a tool for protection and healing. It was a reassuring message and I was fascinated by the glimpse of my past. I could see the scene through my brow chakra, and though I couldn’t see myself the vibe was very clear. At this point out teacher interrupted Clarissa and asked her what the reading meant for my current life. The message was that I have all off that ancient knowledge in me and I just had to unlock it. Finally, she closed the reading by telling me she saw a crescent moon on my forehead, representing the priestess aspect of that life. The word she used was Crone, I had look online but I’m not sure how to interpret it. Would love to get your feedback on this one! The whole reading fits in one heavy paragraph, but there is a lot to think about in terms of what it means for my life. When I started out writing this post it was called Medicine Woman but I've been moved to call it Pagan Priestess. Not that I’m pagan in this lifetime, I do feel in my heart that there's a God out there. And though I apply selective amnesia with the Church’s doctrines, my belief system is loosely based on Catholicism [almost like a movie adaptation that has the same characters, but a different series of events]. Even so, the image of the Pagan Priestess has a spiritual connotation that I am drawn to, not to mention a strong feeling of empowerment. I really enjoy healing and will continue stick with it, but looking back on the reading I get the feeling that even energy healing will be too narrow in scope. We'll see how it goes, for now I am still defining what I stand for and how I want to live my life. I'm being pulled in a new direction, but given this reading the it may not be so new after all.